Open Educational Practice: are communities helpful environments for changing professional practice? One set of key findings was around the role of communities in the release of Open Educational Resources (OER). How professional practice is transformed to support activities underpinning the release of OER, sometimes called open educational practice (OEP), is not well understood. Communities of practice provide a positive environment for changing professional practice. Examples of communities are subject discipline communities or communities within an institution. Each community will have members with different roles (for example academics, support staff, learners), regulated by specific rules. These sorts of communities are important if the benefits of a culture of open resources, open knowledge, free sharing and peer collaboration in education are to be realised. The UKOER programme provided a context to explore these tensions and highlight the benefits and limitations of communities in transforming professional practice. The UKOER Evaluation and Synthesis team, Allison Littlejohn, Isobel Falconer, Lou McGill and Helen Beetham, analysed the contradictions evident in OER release by UKOER project teams. We drew data from our programme-wide synthesis and evaluation (McGill et al, 2010), using project reports and focus group discussions to surface, 1) common issues, key barriers and enablers around OER release,and 2) cultural differences across the sector, detailing evidence of norms, roles, rules and reward structures that foster effective professional practice. Analysis was through mapping the actions of project team members against an activity framework (see figure 1). 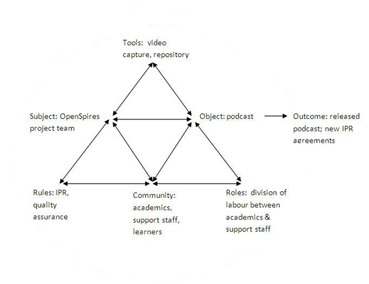 In our study, the activity systems were UKOER projects where project team members (subjects) work on OER (object), transforming it into an outcome using technological and conceptual tools (Engeström, 1987 & 2005). The tool-mediated action of the project teams was mediated by rules and the broader social context of the community within which the activity takes place. Labour was divided among the community members (roles). This framework provided an analytic socio-cultural lens for understanding complex relationships across different groups. This analysis provided evidence that OER projects made best progress where project team were within existing communities. Examples included subject communities, where people already sharing teaching materials. However we also found that in projects where people did not have existing, working relationships, new collaborations were difficult to initiate. For example, project teams found it difficult to convince university support staff to allow collaborators from outside their community access to institutional repositories. A key factor within communities that helped change professional practice was trust. In many cases, when trust was not apparent, peoples’ willingness to open access to resources was reduced (for a more detailed description Falconer et al, 2013). Faculty wanted to retain control over which communities or sub-communities they opened up their resources to, preferring to release content within a closed community. Yet controlled release of resources within closed communities is antithetical to the philosophy of open access, mitigating against the successful release of OER. In summary, while communities may encourage first steps into open practices, they sometimes seem antithetical to the basic philosophy of open release of resources. We found a contradiction between the aim of the UKOER programme to openly release OER and limited practices within some communities, resulting in release of OER within bounded communities. These contradictions present major barriers to successful OER release.